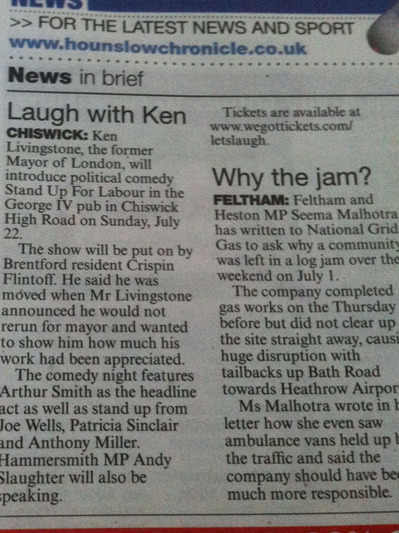 The great thing about combining a comedian with a politician is that it makes publicity. 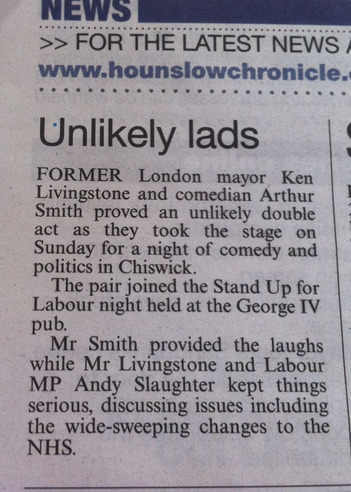 The local paper, The Hounslow Chronicle, was happy to run a story about Ken Livingstone and Arthur Smith appearing in a local event. 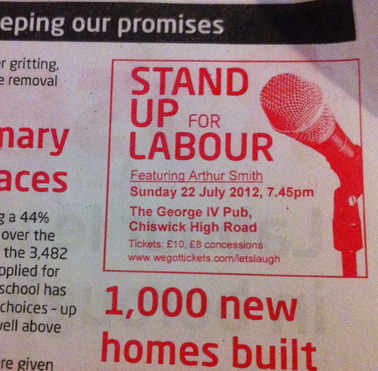 Some pre-show publicity was also found on the local website Chiswick W4. It was not quite as prominent or designed in the ideal way but it was another way of getting the event out to the general public. And with the posters put up in shop windows and the emails and tweets sent out, I guess it was no surprise when nearly 200 people turned up. How many fundraisers get publicity both before and after the event? I don't think a raffle could achieve anything like the publicity and the money raised is probably higher than most dinners and raffles too.